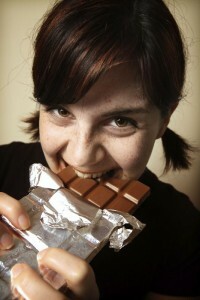 Cure for Chocoholics: Eat Fearlessly! - Am I Hungry?Am I Hungry? Cure for Chocoholics: Eat Fearlessly! How many rice cakes does it take to satisfy a craving for chocolate? Five rice cakes. 7 baby carrots. 4 celery sticks. One orange. A container of light yogurt. And a Snickers® bar. Some people describe themselves as “chocoholics.” For some this is a tongue-in-cheek way of saying that they’re really passionate about chocolate. But for others, they mean that they feel out of control when they eat it. I’ll be the first to praise chocolate’s incredible physical properties, but that alone doesn’t explain the difficulty some people have with chocolate-and many other foods. 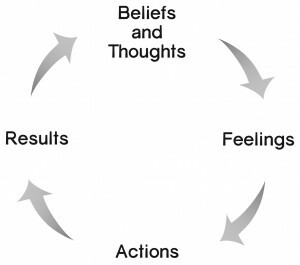 I’ve since come to realize that my own eat-repent-repeat cycle stemmed from what I’ll call “fear-based” thinking. You see, what you think and believe cause you to feel certain ways, which cause you to act in certain ways, which ultimately leads to specific results. In other words, your thoughts become self-fulfilling prophecies. Let’s look at a few examples of fear-based thoughts that people have about eating chocolate that may lead to problematic behaviors-and consider a few “fearless” thoughts that can lead to more favorable results. When you label certain foods “bad,” you’ll feel bad about yourself when you eat them. Ironically, the more you try to avoid these foods, the more power they gain over you. When you finally give in to those powerful cravings, you’ll feel guilty and out of control. You think, “I’ve already blown it I might as well keep eating,” reinforcing your belief that chocolate is bad and that you’ll lose control when you eat it. All foods can fit into a balanced diet using the common-sense principles of balance, variety, and moderation. When you enjoy the foods you love without guilt, you’ll notice that they begin to lose their power over you and that your urge to overeat them diminishes. Over time, you’re able to eat anything, without eating everything. The words “let myself”, “indulge”, and “treat” all imply scarcity, potentially causing you to stock up in anticipation of your next round of self-denial. Practicing self-care is not an indulgence, it is a necessity. Self-care means meeting your physical, mental, emotional, and spiritual needs, including the need for pleasure and enjoyment. Since we live in an abundant food culture, it is all too easy to attempt to meet many of our needs, including pleasure, by eating. Once we recognize what we’re really hungry for, food (yes, even chocolate) can serve its true purpose of fueling our fulfilling lives.